2018 Ohio State Ballot Issue 1. Primary Election Day is Tuesday, May 8. This election, voters will consider Issue 1. 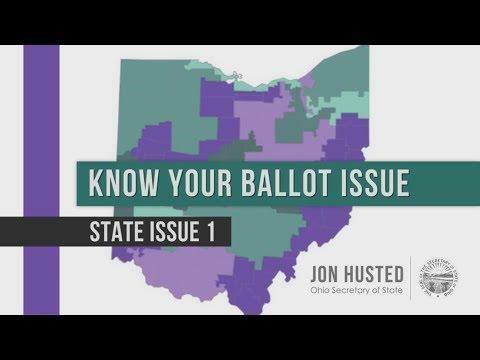 The statewide ballot issue would change the way Ohio’s congressional districts are decided. Under the current system, the Ohio General Assembly votes to draw new congressional district lines every 10 years. The process gives the majority political party more sway over new Congressional maps. Issue 1 would change this and amend the state constitution, establishing a new bipartisan process for congressional redistricting. Issue 1 would also require public hearings before any new map is passed. Supporters say the measure would make redistricting more fair, and limit the gerrymandering that can lead to many communities being split along partisan lines. Opponents argue the state’s existing system of drawing congressional districts is already fair. A "no" vote on Issue 1 would leave the state constitution and the redistricting process as is. If Issue 1 fails to pass in the May primary, advocates, including the Ohio League of Women Voters, say they’ll try again to place the amendment on the November ballot. "Voters have waited far too long for state lawmakers to come together to fix gerrymandering and create fairer elections," says Catherine Turcer of advocacy organization Common Cause Ohio. "Voters deserve to participate in meaningful elections, and Democrats and Republicans came together to pass a resolution that will help rein in the worst excesses of partisan gerrymandering."